You are here: Home / Ethnic Groups / The People of Maluku / Who are the Geser-Gorom? 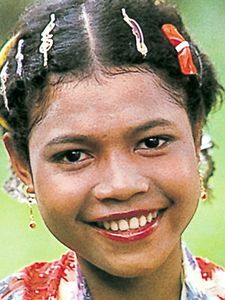 The Geser-Gorom people live on Gorom island and the East end of neighboring Seram island. Both islands are in Maluku Province. The name “Geser-Gorom” (literally, “slide over to Gorom”) reveals a deeper meaning. Each ethno-linguistic group on Seram Island has its own name. However all of the people living in Seram are sometimes collectively called the Alifuru (“Original People”). Seram itself is frequently called Nusa Ina (“Mother Island”). So, the name “Geser-Gorom” reflects the belief that they are a portion of the original people of the world who “slid over” to the East to neighboring Gorom island. The Geser-Gorom language is part of a larger language group called the Banda-Geser. It also includes the Banda, Bati and Watubela languages. The Geser-Gorom language has three dialects: Gorom Laut, Mina Mina Gorom, and Kelimuri. Farming and fishing are the two main livelihoods of the Geser-Gorom. Crops include rice, sago palm, and coconuts. Rice and sago form the main staple. Historically, the Geser-Gorom were famous for their “Kabasa” ceremony, revering the spirits believed to influence the harvest. The Geser-Gorom practice a patrilineal extended family system, and newly married couples usually live near the husband’s extended family. Fathers typically lead the family and are expected to provide living needs. Wives typically take care of children, cook, and do other household duties. A king is assisted by a council of leaders. The Council is composed of the customary chief, Soa leaders (landlords who solve the problems of inheritance and land disputes), the security chief, and the interpreter of news. Since the time of the Japanese occupation in World War II, the system of leadership has started to disappear. Nuclear families function as the basic social unit in Geser-Gorom society. The Geser-Gorom are Muslim. Down through the generations they have applied a mixture of Islamic and tribal law. Alongside orthodox Islam, the Geser-Gorom have animistic and mystical beliefs. On a small scale, the Geser-Gorom need to be acquainted with appropriate technology. They also need more opportunities to improve their work skills. Improving the quality of both formal and informal education could have great value for Geser-Gorom society.